Here’s the plot of ‘1408,’ real simple and real short. Ghost hunter doesn’t believe in ghosts. He checks into a haunted hotel room in New York and the ghosts try to change his mind. His mind is changed. Fade to black. End of movie. ‘1408’ keeps to that schedule so closely, you could set your watch to it. 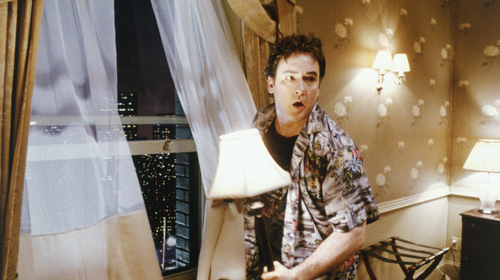 John Cusack stars as Mike Enslin, professional author. Enslin writes books about different haunted places to visit and stay. He’s on his third or fourth book and he’s seen it all. The wear is beginning to show. A book signing is sparsely attended. He checks into a bed and breakfast and is downright rude to the husband and wife running the place. He just wants to get to the things that go bump in the night. And then he hears about the Dolphin hotel. Room 1408, it’s cursed. No one’s ever spent an hour in there alone and come out alive. Enslin decides that it will be the final chapter to his next book. He checks into the hotel. Hotel manager Samuel L. Jackson says that he shouldn’t do it, that it’s too dangerous and that the hotel doesn’t want another death on their hands. Enslin insists. Reluctantly, they hand over the key. And that’s where the fun begins. Or, at least, should begin. It starts simply; the bed is turned down without anyone entering the room. The radio turns on, blaring the Carpenter’s ‘We’ve Only Just Begun.’ And then his dead daughter shows up. And the sprinkler system goes off. And then the room catches fire. And he tries to crawl out the window to another room to find there is no other room. I understand that logic sometimes takes a holiday in horror movies. However, the whole thing just rang false for me, it didn’t resonate like I hoped it would. It’s an amazing performance by Cusack, reportedly one of his top ten favorite performances, but it doesn’t add up to a good movie. The direction is great, the cast is good, the sets are excellent, but, in the end, it just kind of hangs there. The story is based on a Stephen King short story. And, I’ve heard the argument that all good Stephen King movies are based on his short stories and not his books, but this is one that goes against that maxim. (Plus, ‘Misery,’ and ‘Secret Window,’ proved this theory wrong already.) The whole concept of the movie just didn’t resonate with me. And by the end, I was kind of bored and eagerly awaiting the credits.